WASHINGTON, D.C. — (RealEstateRama) — Home sale prices rose almost 2 percent in July 2016 and homes sold were down 9 percent when compared to July 2015. According to the Housing Trends Report by Iowa Association of REALTORS®, the median sale price for July 2016 is $152,500 as compared to $150,000 in July of last year. The number of homes sold in July dropped 9 percent from last year. 4,365 homes were sold in July of this year, while 4,798 were sold during July 2015. However, the number of properties year-to-date were 2.3 percent higher than the same period last year. The days on market (DOM) increased by 7 days from last year. 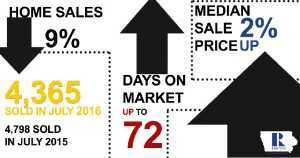 The average days on market in July 2016 was 72 compared to 65 DOM in July 2015. “In many areas of Iowa the market favors sellers in terms of inventory; however, buyers still experience very low mortgage rates. Combine that with the fact that historically, Iowa home prices neither rise nor fall dramatically and you have a win-win for both parties on a home sale and purchase.” stated IAR President Ken Clark. The information used to create the IAR July 2016 Housing Trends Report was current as of July 18, at 2:30 p.m. The information is subject to change due to the dynamic nature of the IAR’s housing statistics system, which is updated hourly based on information present in local participating MLS (multiple listing service) systems. The Iowa Association of Realtors® is the state’s largest real estate professional organization representing over 6,900 members and affiliates. The IAR releases a Housing Trends Report each month. Data is collected from local Realtor® boards through their multiple listing service (MLS), which tracks sales activities in the board area. IAR compiles all of the local board data into the statewide report each month. Reports are available online to IAR members and affiliates with a login and password. Anyone is eligible to become an IAR affiliate. For membership information, visit www.iowarealtors.com. For more information contact Mark Gavin Director of Communications and Events at the Iowa Association of REALTORS® mark (at) iowarealtors (dot) com 515-309-9345.